Every year NWSS has celebrated Israel’s Independence Day with a special service and entertainment on the following Saturday, Shabbat Atzma’ut, thanks in the past to Avril Hallé and members of the Israel Group. 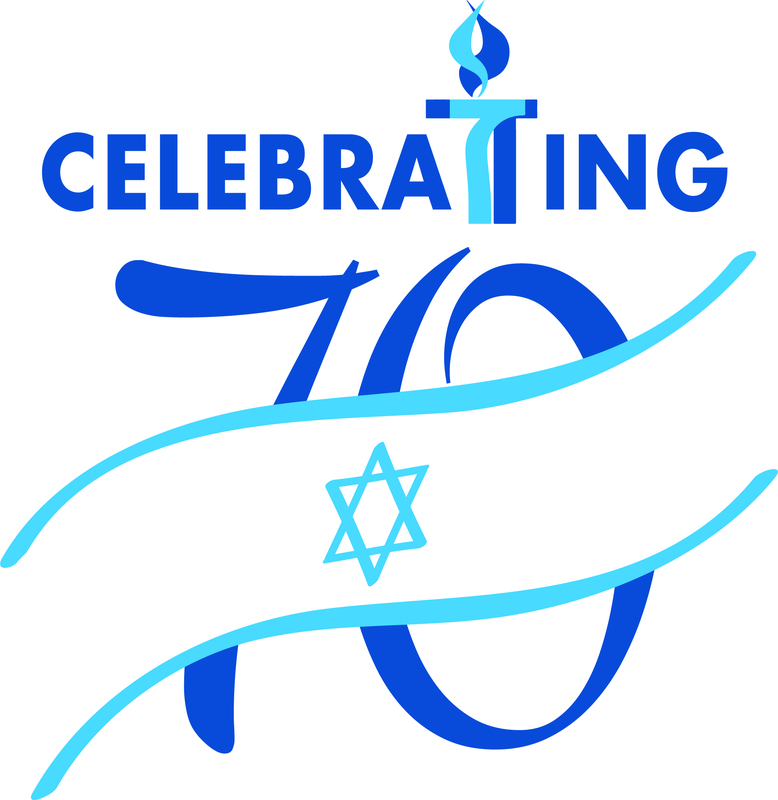 This year we marked a special birthday, Israel’s 70th, which I had the privilege to lead. Few of those present at the joyous festivities on the day of statehood would have imagined that Israel would not only survive the attack of five Arab armies the following day but would go on to flourish and prosper to the extent that it has. The Declaration of Independence ends with the phrase “With trust in the Rock of Israel, we set our hands in witness to this Declaration……” and goes on to state the place and date. Yet, as I learned recently, the phrase ‘Rock of Israel’ nearly derailed the ceremony. Why? Because that phrase, in Hebrew ‘Tsur Yisrael’, is the only oblique reference to G-d in the Declaration and was a compromise between the religious Zionists who insisted that G-d’s name was a necessary component, and the secular Zionists who insisted on the separation of religion and state. Plus ça change….? So in the spirit of healing and fellowship we started the service with the song ‘Hineh ma tov uma na’im…’ ‘Behold, how good and pleasant it is for brothers and sisters to live together in unity’ (Psalm 133:1). Marilyn Glicker and I who led the service had the pleasure of welcoming nine people to the bima for Torah readings and blessings, including two born in the same year as the state. Rabbi Kath gave an intriguing account of her introduction as a young, ardent and very left-wing girl, to the testing conditions of a Negev kibbutz. A big bonus was meeting the attractive dark-haired youth who was to become her husband Meir and his family in a culture both familiar and very different from her own. Lastly, our acclaimed Israeli singer, Yoav Oved, not content with his mission to treat us to a concert later on, gave us both a short version of ‘Yerushalayim shel Zahav’ (Jerusalem of Gold’) accompanied by Laurence on guitar and a very moving rendering of the ‘Eil malei rachamim’ prayer, in memory of those who died in the War of Independence, subsequent wars and acts of terror. Then following an Israeli-themed buffet lunch, bedecked with flags and balloons, brought to us by all who attended, came the highlight of the day, the concert. Yoav who has performed for us once before, completed his Bachelor of Music at Royal Holloway College, University of London and has since worked closely with the Jewish Music Institute in bringing Jewish music, both Sephardi and Ashkenazi, to the wider audience. He has given recitals in London, Riga and Paris and has also participated as a soloist with the LSO. He has recited the ‘Eil malei rachamim’ prayer in City Hall. The Mayor, Sadiq Khan, and the Assembly of London attended. Yoav and his talented pianist and accompanist, Harry Stiles, started our concert vigorously with two ‘Hora’, songs to the dance with which most of you are familiar.’ Hora Mamtera’, the sprinkler song, echoed the activity of that ubiquitous device in watering the grass and crops of Israel’s early parched kibbutzim and moshavim, and ‘Hora Medura’, the campfire song came next. It continued with popular favourites like ‘Od lo Ahavti Dai’ (‘I Haven’t Loved Enough’) ‘Halleluya’, the Israeli winner of the 1979 Eurovision Song Contest and, of course, the perennial ‘Yerushalayim shel zahav’, this time in full. For songs such as these latter ones song-sheets were provided giving the transliterated Hebrew lyrics so that we could all join in, as well as translations in English. It also included more reflective songs like ‘Kalaniot’ (‘Anemones’) tinged with wistfulness and with a historic allusion to the red berets worn by British soldiers of the Mandate era. There were also uplifting and patriotic songs such as ‘Ha’amini Yom Yavo’ (‘Believe it a Day Will Come’). Lastly, Yoav gave us a flavour of songs with strong Yemenite connections, part of Yoav’s own heritage, dating from the influx of new immigrants from that country, especially during Israel’s early years of statehood. Yoav had many of us clapping to the sometimes tricky syncopated beats of the songs. I would like to thank all members of the Israel Group and others who unstintingly helped to make Shabbat Atzma’ut 70 such a special event for us.